The 17-strong 3U PK range has 115/230VAC switchable input voltage and single, bi-volt and tri-volt outputs with power ratings from 30 to 240 Watts. 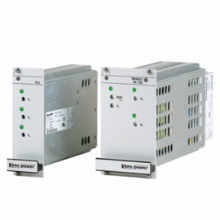 The units are convection cooled, improving system reliability, and feature remote on/off and power fail. All outputs are adjustable and have automatic short circuit protection.